Solve each system of equations by the method of your choice. Write a system of equations and solve. One number is four more than twice the second number. Their total is 25. Find the numbers. California 1 South is a historic highway that stretches 123 miles along the coast from Monterey to Morro Bay. Suppose that two cars start driving this highway, one from each town. They meet after 3 hours. Find the rate of each car if one car travels 1 mile per hour faster than the other car. Find the measures of two complementary angles if one angle is 10º more than three times the other. Polynomials can also be written in factored form. For example, a² + 8a + 12 = (a + 6)(a + 2). The process of writing a polynomial as a product of factors is called factoring the polynomial. GCF of the variable factors. Find the GCF of the following lists of terms. We will then divide each term of the polynomial by 2h³ and write the quotient in then close the parenthesis.
. We can multiply (distribute the 2h³) to check our result. Therefore the factored form of x² + 7x + 12 is ( x + 4 )( x + 3). Notice that 4۰3 = 12, the last term, and 4 + 3 = 7, the coefficient of the middle term. When we start to factor x² + 7x + 12, we should think of the factors of 12 that will add to be 7. We know that 1۰12, 2۰6, and 3۰4 all equal 12, but the pair of 3 & 4 is the only pair that adds to be 7. If we had x² + 13x + 12 as our trinomial, our factored form would have been ( x + 1 )( x + 12 ). If we had x² + 8x + 12 as our trinomial, our factored form would have been ( x + 2 )( x + 6 ). We also need to be aware of a possible GCF which may need to be factored out of the trinomial as our first step of the factoring process. For example, to factor 20. 3x² + 30x + 63, we will start by dividing each term by 3. 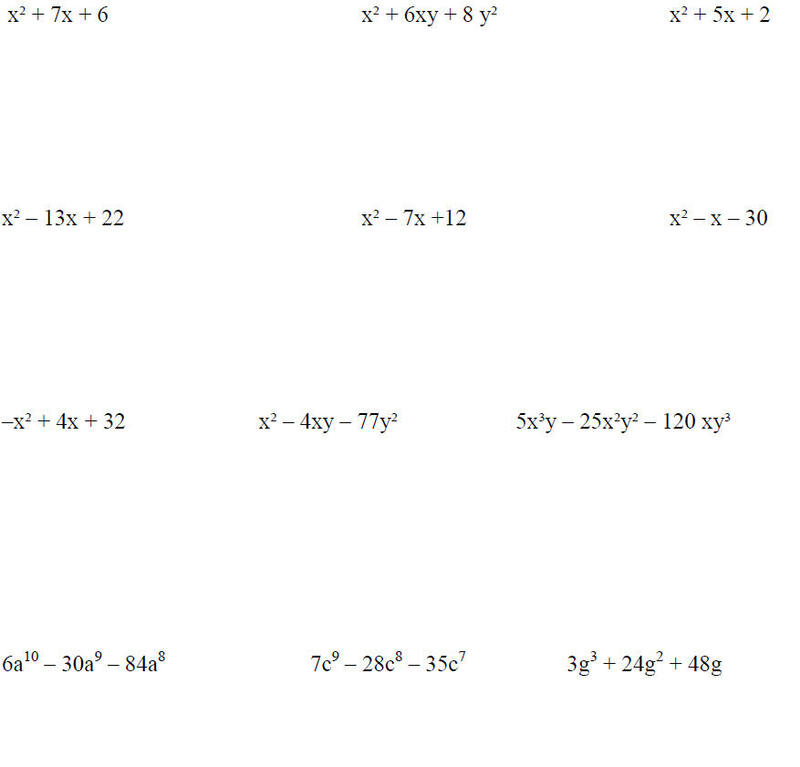 Factor each of the trinomials completely. If a trinomial cannot be factored, write prime.